An important part of conservation within Africa is community relations – maintaining good communication and mutually beneficial relationships with communities can go a long way to protecting wildlife and natural areas. Leopard Mountain Safari Lodge exists within Zululand Rhino Reserve, and as such strives to support the reserve management team’s projects in regards to conserving fauna and flora, but also supporting, improving and enriching the lives of community members surrounding the reserve. After all, many of the staff members you will meet during your stay at Leopard Mountain will be from those communities, it’s always important to look after your family. 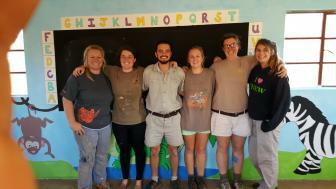 One of the recent projects that began in April was the upgrade of the Sekane Community crèche. P.Trimborn Agency ignited the project with a generous donation towards building materials and supplies, and what followed were donations of food, toys and stationary. I was also lucky enough to join in the painting of the crèche after local builders were employed to revamp the building. I lent my Michelangelo-gifted talents to the team and painted some of the best-looking rocks one could ever lay their eyes on – later I even assisted with the elephant, really stretching my skills to the maximum. My time at Leopard Mountain has instilled a passion for wildlife and conservation that I doubt I will ever lose – however this project was slightly different and it was fantastic to see and take part in the work the reserve is doing in another important area. The core team of ladies really did a fantastic job and the finished product is a crèche the Sekane community are already proud of. There were great times from the children who frequently visited during the painting, the elderly woman who blessed the crèche while we continued the work and the ladies obsessively entertained by kid goats from the community. The crèche will be opened within the first week of November through an event hosted by the Zululand Rhino Reserve Foundation, representatives from P.Trimborn Agency, the local community Chief, Sekane community members and volunteers from the lodges within the reserve. I cannot wait to be there representing Leopard Mountain and the donations and effort we have made!